O my God! Please do not let this be the last time I visit him (Imam Al-Reza). Imam Al-Reza deserves more than that. Then please resurrect me with him and with my forefathers (his forefathers) - those of the past. And my Lord, if you keep me alive then please bestow upon me to go on his pilgrimage to him as long as I live. Verily, Thou hast power over all things. 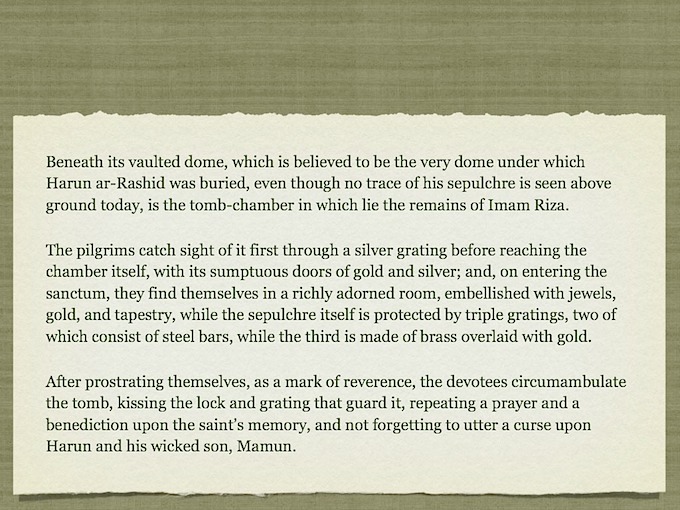 Source: 'Uyun Akhbar Al-Reza' (The Source of Traditions on Imam Reza (a.s.), by 'Sheikh Sadooq' and translated by Ali Peiravi. 2006. You should note that there are also detailed notes (in pdf files) given in the Downloads section of this site. Those notes have the actual ziarats in Arabic, English translations and transliterations. 1 - To enter the holy shrine after performing Wudu (ablution) or Ghusl (bathing). 2 - To wear clean, tidy and new clothes. 3 - While going towards the holy shrine, the pilgrim should walk with peace and dignity. The pilgrim should walk with humility by keeping the head down and should develop the concentration of mind and presence of heart. 4 - In the holy shrine, the pilgrim should be busy praising the Creator and the heart should remember the greatness of Allah. Pilgrim should continuously invoke blessings and salutations (Salawat) upon the Holy Prophet of Islam (S.A.W.) and his Holy Ahl ul-Bayt (A.S.). 5 - In the holy shrine, the pilgrim should avoid vain talk and should abstain from altercation and hostile discussions. and seek the permission of entry from the Holy Imams (A.S.). 7 - The pilgrims should abstain from creating any sort of trouble in the holy shrine and should abide by the instructions of the attendants of the holy shrine. 8 - When the pilgrim sees the holy burial chamber (zarih), before starting the recitation of ziyarah he should first recite Takbir i-e to recite Allah Akbar. 9 - Pilgrim should try his best to recite the ziyarah standing. 10 - While reciting ziyarah the pilgrims' face should be directed towards zarih and for the supplication (dua) the pilgrim should move toward the upper part of the zarih and recite the dua while facing the Qeblah. 11 - The pilgrim should recite the ziyarah only narrated by the Holy Imams (A.S.) for example Ziyarat -i- Aminullah and Ziyarat -i- Jameh -i- kabeer, and should abstain from reciting any non - authentic and non-appropriate words in the ziyarah. 12 - The pilgrim should not recite the ziyarah in a raised voice. 13 - After the recitation of the ziyarah, pilgrim should perform the two rakah Namaz-i Ziyarah and present the thawab (spiritual reward) of it to the Holy Imam (A.S.). 14 - After the Namaz-i Ziyarah the pilgrim should recite the recommended supplications (dua) and then should pray to Allah Almighty to grant everyting good and beneficial to his relatives, friends and all those who had requested him to pray for them in the holy shrine. 15 - The pilgrim should recite the Holy Quran as much as possible and present the thawab of it to the holy soul of the Immaculate Imam (A.S.). 16 - The pilgrim should pray to Allah Almighty to hasten the advent of Imam-i Zaman Hadrat Mahdi (A.S.) and to grant prosperity and success to Islam and the Muslims in the world. The following is taken from Jackson (1911).